20% gratuity added to parties of 8 or more. Maximum of 3 checks per party. * Notice: food cooked to order, consuming raw or under-cooked meats, poultry, seafood, shellfish or eggs may increase your risk for food borne illnesses, especially if you have certain medical conditions. To our guest with food sensitivity or allergies: Stripers Waterside cannot ensure the menu items do not contain ingredients that may cause an allergic reaction. Choose your favorite Ketel One Botanicals flavor, with simple syrup & splash of soda water. Award Winning Food Enjoy delicious food with a beautiful oceanfront view. Make a Reservation Friendly staff are waiting to take your order. Stripers Waterside serves a Sunday brunch menu with 30 beers on tap, giving Norfolk a new place to enjoy breakfast or after-work drinks by the water. 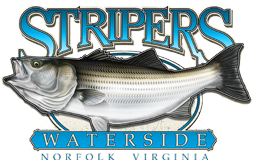 © 2019 Stripers Waterside - Norfolk, VA.